Candlelighters Childhood Cancer Foundation of Nevada (Candlelighters) was chartered in 1978 by two families, each of whom had a child being treated for cancer. With little to no resources to help them navigate the world of childhood cancer, they came together to create a network of support for families affected by the disease. They believed that families could find strength, knowledge, and comfort by banding together during their most difficult times. They wanted to use their experience to lessen the burden of those they knew would follow. Since that time, thousands of children in Nevada have been diagnosed with cancer. 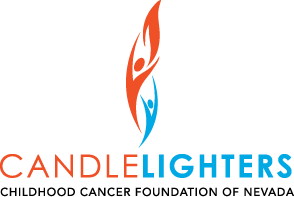 Today, Candlelighters maintains a full-time office with professional staff focusing on three main areas of support: emotional, quality of life, and financial assistance. Candlelighters serves approximately 125 families monthly and as many as 600 children (both siblings and diagnosed children) throughout the year. A child diagnosed with cancer being treated in Nevada is the only requirement to become a Candlelighters Family. All programs and services are provided at no cost to the families. Our mission is to provide emotional support, quality of life programs, and financial assistance for children and their families affected by childhood cancer. Our vision is to alleviate the isolation many families feel at the time their child is diagnosed. We offer our love, care, encouragement, and understanding so that nobody will face the uncertain world of childhood cancer alone.